Depart in a comfortable, air-conditioned minivan and relax during the scenic 3.5-hour drive to the beguiling Halong Bay. Watch the scenery transform from metropolitan sprawls to scenic natural beauty as you approach your destination. Stop at Hong Ngoc Humanity Centre en route to purchase handicrafts made by undeveloped communities in the region. 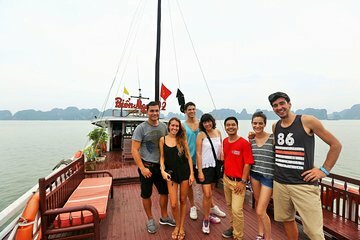 On arrival in Halong City, climb aboard a Chinese junk to cruise around the idyllic limestone islands of Halong Bay, a UNESCO World Heritage-listed site famed for its spectacular vistas and majestic multitude of islands. Gaze at more than 2,000 islets as your guide regales you with legends of dragons and secreted treasure. Discover secret grottoes and mystical caves then disembark at a rustic fishing village to delve into the culture and customs of local inhabitants. Return to your boat and feast upon a sumptuous seafood buffet of freshly caught fish. Relax during your return journey to Hanoi City and travel back in a comfortable, air-conditioned coach. This is a great trip if the weather is nice. Unfortunately, we had a cloudy day. The cave we visited was beautiful. Our guide did an excellent job and everything was very well arranged. This is a must do when visiting Hanoi. We went with Urban Advebtures on this trip. First of all their team is wonderful. San was with us and explained everything clearly and with great passion. He loves his country and by the time he is done you will too. Great trip. Clean bus. Smooth driver Mr. Hill. Good food on the boat. Highly recommended. Be prepared for a long day of travel, but the view of Halong Bay us worth it. The walk through the cave was very interesting. Did feel like we were on the set of Kong Island! Pretty good tour of Halong Bay. Everything was easy and the guide was friendly. The tour was good, we were being picked up on time and the tour guide was very knowledgeable about Halong Bay history and spoke very good English. All and all we had a very enjoyable day. Enjoyed this trip immensely, was guided by Tam who is first class, she knows her history, geography and is an all round superb host - nothing was too much trouble. Her English and manner is a credit to Vietnam, the people and the nation - couldn’t recommend the tour more! I really was looking for a more private group tour and this tour more than exceeded my expectation. My wife and I were the only two in the group! Our guide -- Chinh -- and the driver who were friendly and helpful showed up in Toyota Innova and took us on a smooth ride to Halong Bay. Initially we thought we would meet other people on the boat, but to our even further surprise we were the only two guests on the boat too. The service, the boat and the food were nice, the weather on that day not so as it was foggy but nothing anyone could control. This was a great tour. Our guide, Hoa, was awesome! She had plenty of information to offer about Vietnamese culture during the long drive, and about Halong Bay and its caves etc. during the actual tour. Her English was great, and not only was she very informative, but very friendly with a great sense of humor. There were only 3 of us in the tour group, and Hoa seemed genuinely interested in getting to know us and making our trip fun. The food on the boat was delicious beverages are excluded but we knew about that ahead of time, so that was no big deal, just make sure you have some money on you. 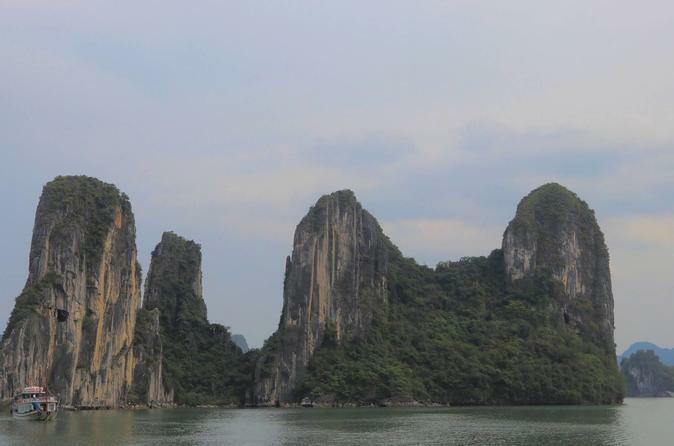 It was a cloudy day, but we still got some breathtaking views of beautiful Halong Bay. The reason I didn't give this tour 5 stars is because of the pushy salespeople we encountered. One was at the handicraft outlet on the way there the items she showed us were nice but not worth 2 million VND. She followed us until someone else who worked there started talking to her. The second one was a member of the service crew on the boat towards the end of the tour, she came up to the boat deck with a bunch of jewelry for sale, and because I was the only woman on the tour, all her attention was focused on me. I had to ask Hoa to politely tell her I wasn't interested. Then when we went back downstairs, she tried to sell us Vietnamese silks. She seemed a little annoyed when we said no thanks. So overall, it is definitely a worthwhile tour that I recommend booking, but may I suggest mentioning to your guide that you are not interested in purchasing anything, just to avoid any awkwardness. And dress warmly if you're there in the winter!